Peru’s rich culture will enchant you with its incredible charm and irresistible sights. 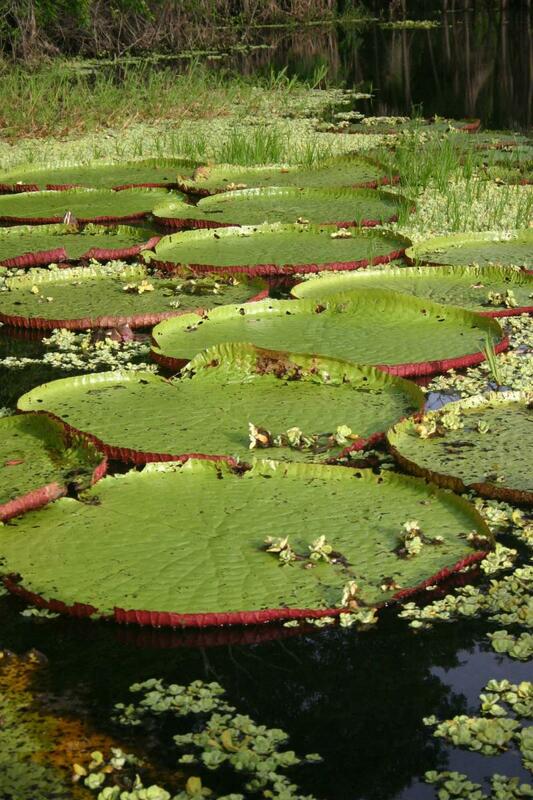 Ancient ruins, beautiful cities, and the mesmerizing Amazon await you. The mix of Andean culture and sensational wildlife of the rainforest beckon you with spectacular scenery, rich textiles, delicious nourishment, and non-stop wonder. 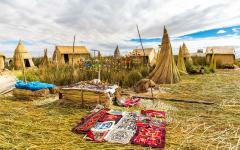 From the heights of Lake Titicaca to the unique Nazca Lines, Peru is filled with marvels to be seen and experienced. 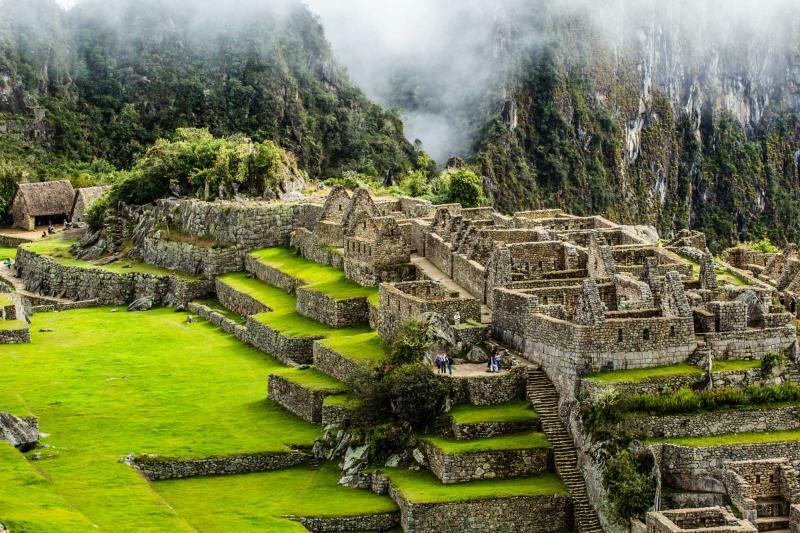 From Incan wonders to wild adventures, this trip will truly be Inca-credible. Explore Peru on this 12-day journey meant for wanderers, adventurers, Amazon enthusiasts, Incan fanatics, line lovers, cruisers, flyers, and anyone that has ever wanted to spend time enjoying themselves within the comforts and sensations of other cultures. From the seaside city of Lima to the towering Incan capital of Cusco, the depths of the Amazon River basin to the heights of Lake Titicaca, no matter how you spend your time in Peru, as long as your eyes are open, the wonders will never cease. 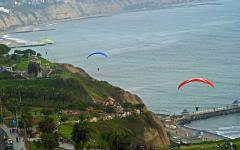 Your journey begins in Lima with the mega city open for you to explore. The Surquillo market is perfumed with sensual aromas that bring thoughts of comforting soup and rotisserie chicken hovering overhead. 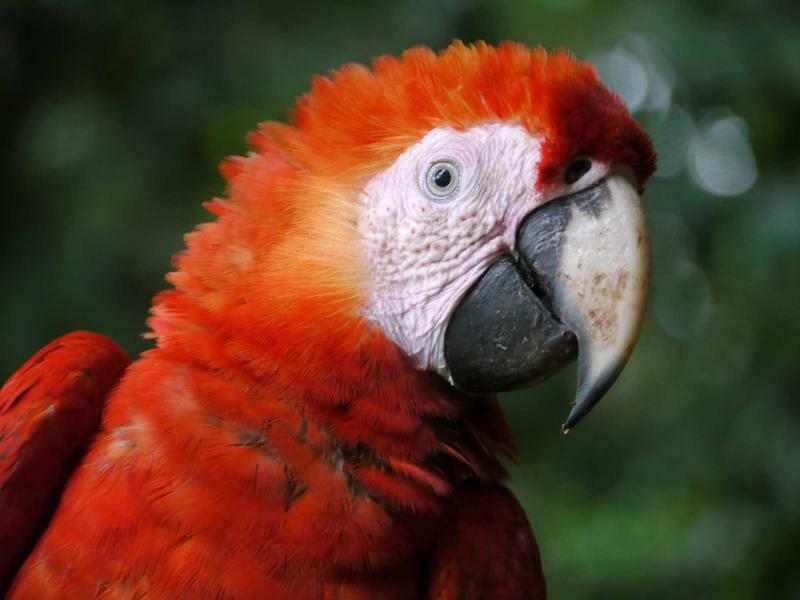 In the Amazon you will journey by boat to your accommodation where you can witness the wild macaws dangling along the cliff side, fluttering their beautiful wings while eating the famous clay lick. Arrive in Cusco, the Incan capital, and witness the remnants of the Incan Empire beneath Spanish structures and lingering over the city itself. The ruins of Pisac and Ollantaytambo sit on the outskirts of Cusco and above the traditional Andean villages. Machu Picchu tours are a must see in Peru, so venture deeper into the Sacred Valley until you reach the city that sits amongst the clouds - the Lost City of Machu Picchu. Continue your discovery of Peru as you depart Cusco for the lakeside city of Puno. Along the way you will visit the Sistine Chapel of the Americas in the town of Andahuaylillas. The glistening interior brings tears to your eyes and pilgrims from all over the world. 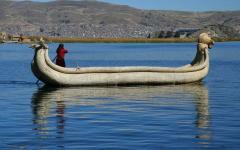 Once in Puno you will be sitting on the shores of the famous Lake Titicaca. 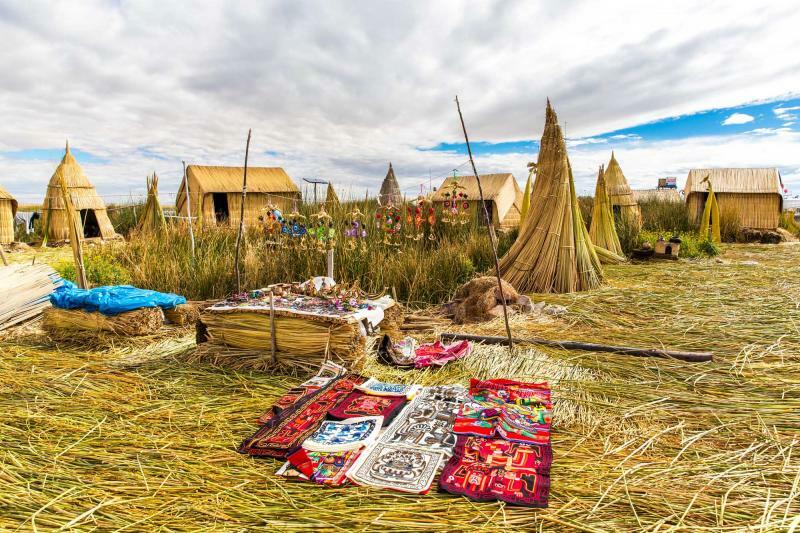 Tour through the lake to witness the incredible floating islands of the Uros which drift along the gentle wake of the water, and have been doing so for centuries. 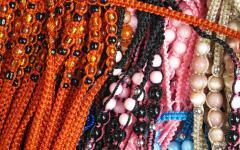 Spend some time on the island of Tequile; the Tequilaños are known for their colorful and warm textiles. 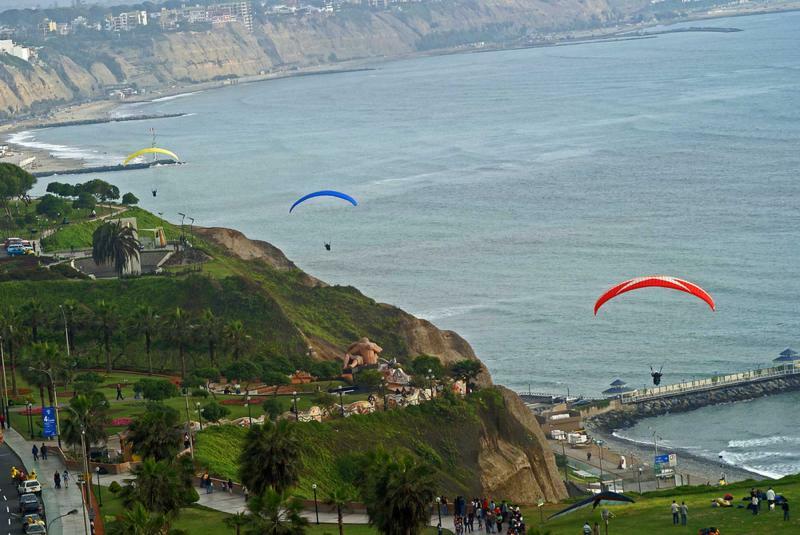 Return to Lima to explore the beauty of the city before venturing out to Ica and flying over the arid desert to see the sensational Nazca Lines. The lines have decorated the desert for almost a millennia and anthropologists still wonder at their meaning. 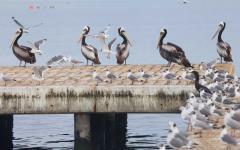 The remainder of the day brings you to the oasis Huacachina Lagoon and eventually you will settle in Paracas. 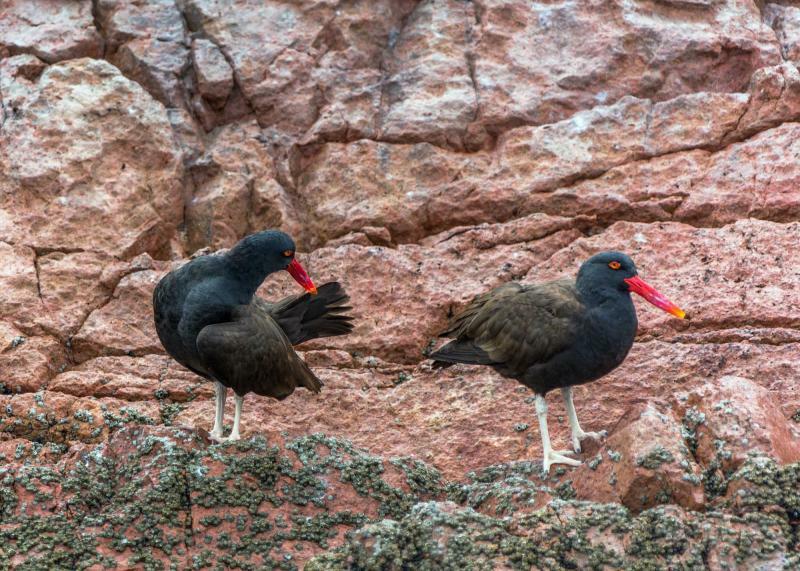 Your final day in Peru brings you off of the shores of Paracas and around the beautiful Ballestas Islands where sea lions and sea birds roam freely along the rocky shores. Stop for lunch at a lovely, centuries-old hacienda before returning to Lima and departing for home. The world is filled with wonders; however, the entire world wouldn’t be able to contain Peru because every day in Peru will be Inca-credible. 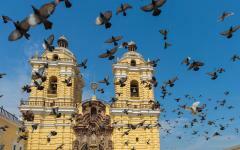 Arrive in Lima and revel in the City of Kings. The neighborhoods stretch across the metropolis, from the cool shores of the ocean to the foothills of the surrounding mountains. The boisterous sounds of trolley cars rushes through the streets. You can smell the ocean in the air mixing with sweet citrus from fresh ceviche. Each neighborhood offers a variety of culture and flavors distinct from one another. 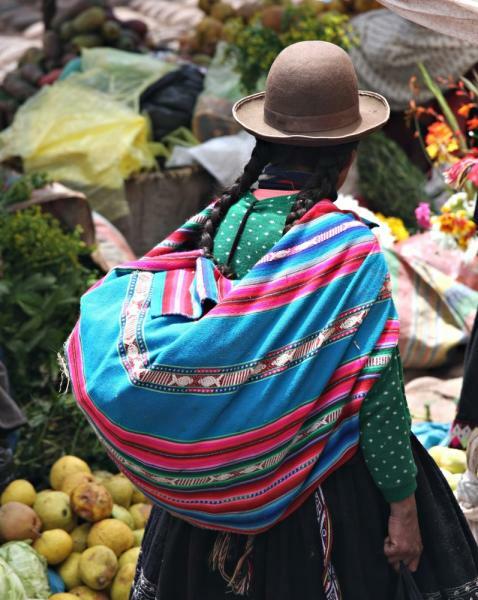 Visit the Mercado Surquillo to see the sensational farmers’ market of Lima, where the stalls are perfumed with decadent goods straight from the sea as well as the fruits of the mountains. Huacatay, Peruvian black mint, hangs from the stalls giving a zesty and luscious spice that carries through the aisles. The vibrant colors of bananas and sweet potatoes carry along the market like rainbows. 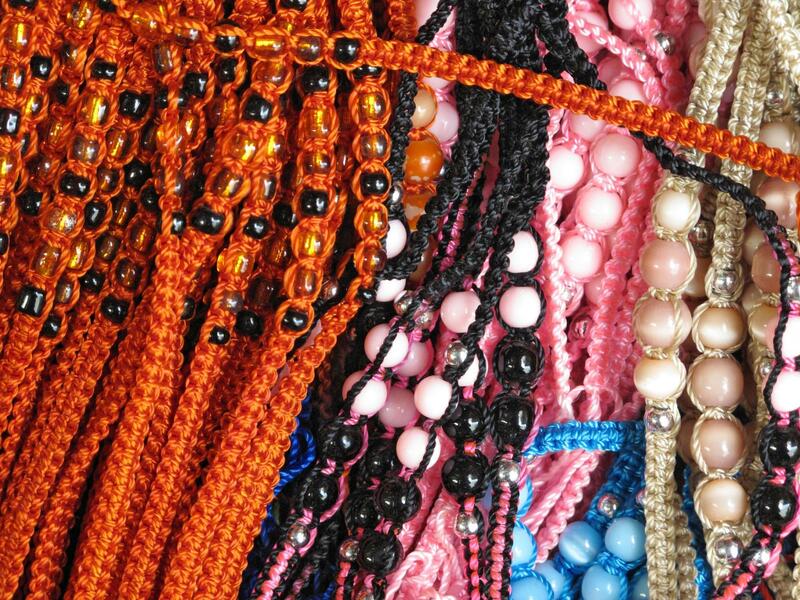 The life of Lima is active and is buried deep within the cultural roots of the people that call the city home. Today you will depart from the City of Kings and make your way to the incredible city of Puerto Maldonado located along the Amazon Basin. You can feel the warm weather wrap itself around you as you exit the airport and board a boat that will take you into the depths of the forest. The trees reach along the riverbanks as far as you can see. The river is wide and calm. 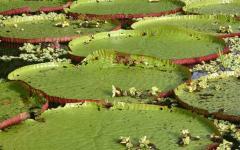 The splendors of the Amazon are becoming increasingly clearer and inviting to you as you explore the sensational wild. The city boasts a colonial past left over from the rubber boom. Various buildings have lavish balconies that wrap around the entire second floor, decorated with detailed wooden railings. The scent of sugar fills the streets from milled sugar cane juice made fresh from street venders. Board another boat for an excursion along the river where you can settle into the exquisite accommodation of Posada Amazonas, located up river from Puerto Maldonado. Watch the speed of the black and white Pied Lapwing as it maneuvers through the sky along the edge of the canopy. Black Skimmers skate across the water’s surface in search of fish, the sound of rippling water rises into the air. 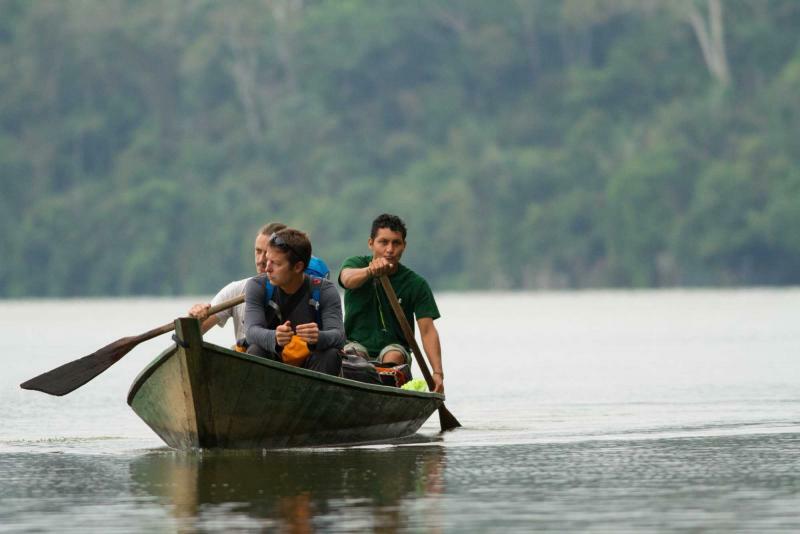 Arrive at the beautiful and unique Posada Amazonas where wooden bridges stretch over the lush Amazon surface. The thatched roofs of the resort blend into the canopy from a distance. A cool breeze drifts through the room and the leaves outside rustle. You can hear the distant caw of parrots as you settle into the Amazon. Rise with the sun as the light begins to shine through the canopy. Morning in the Amazon brings the cool air beneath the trees. The sounds of bustling birds sing in the distance. Venture out to explore the bustle of the jungle and come across the fabulous clay lick. The cliff side is filled with natural vitamins within the mineral rich soil, hovering beneath lush green vines. The clay shines a faded pink in the morning sun while macaws and parrots flap their wings, caw at one another, and climb along the cliff snapping at the wall. 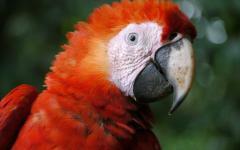 Stunning blues and reds wave into the air with each wing flap of the macaw. Parrots glow green and yellow against the hue of the clay. From the wall it is a lovely and quick hike through open vines and lingering tree branches to reach Tres Chimbadas Lake. The water is serene, mirroring the sky and the surrounding trees along the shore. 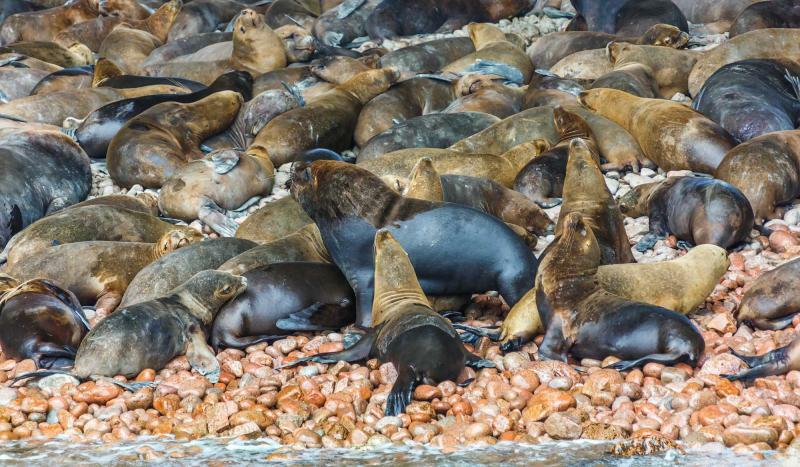 Whether on a boat or at the edges of the observation deck, you can watch the water come to life with turtles slipping along the surface or giant river otters sunbathing on the shore. They are fast in the water but large on land reaching over five-and-a-half feet long. Their tails help propel them through the fresh lake and to blend in with fallen branches. Atop the 100 foot observation deck you can view the lake and the wildlife almost from within the canopy of the trees themselves. The kaleidoscope of toucans is iridescent against the leaves. Macaws radiate a deep blue against the tree bark. The peaceful moments above the Amazon give you a deeper connection to the majesty of the wild and the sensations of the incredible. Leave the stretching waters of the Amazon behind you as you fly above the canopy and make your way over the Andes and venture into the oldest continuously inhabited city in South America, Cusco. The air is crisp and cold along the cobblestone streets of the city. The stones are a vast difference from the wooden walkways and earthen paths of the Amazon. The cologne of burnt sugar follows you through the streets, along with the tanginess of Pisco, the traditional Peruvian spirit. Enjoy the remainder of the day on a tour through the city and its surroundings to experience the collection and connection of Spanish and Incan remains. The Plaza de Armas is considered the main square of Cusco and looks like the capitol of a city in Spain. It is easy to see that much of colonial Cusco was built on the foundations of the Incan stonework and layout. Santo Domingo Church is considered to be the mother of the Roman Catholic Archdiocese of Cusco filled with history and an incredible amount of colonial artwork having transitioned into more of a museum in recent years. The church was once the ancient Temple of the Sun, home to gold lined walls and Spanish dreams of El Dorado. Although the foundation of the original structure remains, the Spanish church rose in its stead. The church is constructed with mortar and stone giving the structure a medieval look and a textured feel. The spire is adorned with a dome and various smaller spires that wrap around the bell tower. The magnitude of the church is impressive; from its entrance it would seem that the church was two stories; however, as you journey through the building you find that the church follows the downward slope of the street, leading into lush gardens that lay beneath the looming stone. The flowers that spread along the courtyard give a gentle bouquet to the coarse and aged grit. The beauty of Cusco is filled in its layers of history, along with its hidden and not so hidden gems, from the Spanish facades to the Incan ruins. Venture into the depths of the Sacred Valley where the Andean culture remains strong and the varied remains of the Incan culture are built along the walls of the valley. The ruins of Pisac sit along a plateau giving a tremendous view of the surrounding valley and the encircling mountains. The stones shine a rich red and pink in the morning sun, in contrast to the deep green of the valley. Terraces climb the sloping mountains like stairs. The citadel sits at the top of the terraces, the structures still intact; the aged brick open to the elements and fragile against your skin. Continue to the royal estate of an Inca Emperor at Ollantaytambo. The site was once the capital of the Incan empire during the resistance of the Spanish. The scent of roasted choclo, large kernel corn, drifts from the town and lingers against the stones of the ruins. Steep terraces climb up a central hill of the site, surrounded by sheer rock making the area look more like a fortress than a religious center. Each tier stretches the width of the mountainside and clambers up the valley from the river below, marked with one set of stairs. The gentle trickle of water rises from “The Bath of the Princess,” a single stone with tiered designs carved into a fountain that sits at the base of the ruins. The valley is lush with incredible vegetation and history spreading through the hills. Today you will wind through the foothills of the Sacred Valley and along the rushing Urubamba River. The green valley and mountaintops never seem to fade. Arrive at the base of the Machu Picchu and ascend into the saddle of the mountain 1,000 feet above the rush of the river. Climb the stone steps that take you higher to the plateau where the rocky walls open and give way to the expanse of the Lost City. The integrity of the stone structures continues to decorate the mountaintop, as Huayna Picchu casts a shadow over the ruins from its mammoth peak. In the opposite direction you can see the three pillars of the Sun Gate sitting above the clouds and looking down on the city. The grass is soft and lush. The ruins give a faint musk of wet stone. Terraces continue to tier the mountainside. The hitching post of the sun stands at a tall and open point; it’s large, round stone standing above the city, within the confines of the remaining walls, continuing to tell the time. Venture back to banks of the Urubamba River and settle into the luxuries of Machu Picchu Sanctuary Lodge. The sun rises over the stones of Machu Picchu and brings a bright glow to the plateau. The clouds dance around the terraces before disappearing. For an incredible view of the Lost City, take the long walk to the Sun Temple. The stone path leads the way along the mountainside. Llamas graze on the rich grass, their mouths moving sideways with each bite. Once at the Sun Temple you can see carvings circle around the tower to pinpoint the position of the sun during the summer solstice. Rock slabs and stones surround the structure, but the most recognized detail about the Sun Temple is the view. The entire city of Machu Picchu is open to you like a postcard, from the details of the ruins to the peak of Huayna Picchu. The clouds have long dispersed and your view of the Lost City of the Incas is nothing less than breathtaking. Eventually you will make your way back to Cusco, but for the moment you can sit along the smooth stone slabs of the temple and enjoy the view. Today you will depart from the pearled city of Cusco and venture farther along the stretch of Andean beauty. The altiplano, which stands for the high altitude plains, is a copious mixture of craggy rock and swaying grass. Stop in Andahuaylillas, known for its incredible baroque church nicknamed the Sistine Chapel of America. The exterior is stationed above several stairs; the white bell tower is iridescent in the sun while the mountains surround the church in the background. The pillars of the façade are made of alternate, smoothed stone, the second story adorned with a mosaic of Andean life. Inside the church you are immediately surrounded by a haze of frankincense. The columns are gilded to the ceiling where geometric designs add to the hypnotic artwork of the church. With the wind of the high plains calling, you continue on to Puno where the luxurious Sonesta Posada del Inca Hotel awaits you. As the largest high altitude navigable lake in the world, Lake Titicaca sparkles outside your window. The sun rises over Puno and radiates along the water of Lake Titicaca. Venture out onto the lake, the scent of fresh water drifts into the air and mist bounces off of your cheeks. The boat glides through the water. Islands decorate the horizon; however, a few islands seem to shimmer in the morning light. They drift with the wake of the lake and your boat nestles into a small dock. 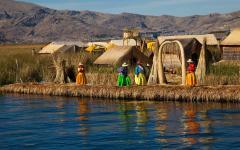 You have arrived at one of the famous floating islands of the Uros. The islands are made with dried totora shoots, wound and woven to make a steady surface. You can feel the rough shell of the dried grass on the soles of your feet. The fragrance drifts through the open air of the lake. The houses are made from the same reeds as the island itself. 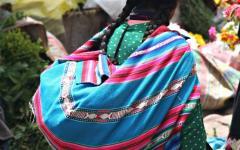 The locals are as colorful as the textiles you saw in Pisac market, bright pinks and reds gleaming along the clear waters of the lake. 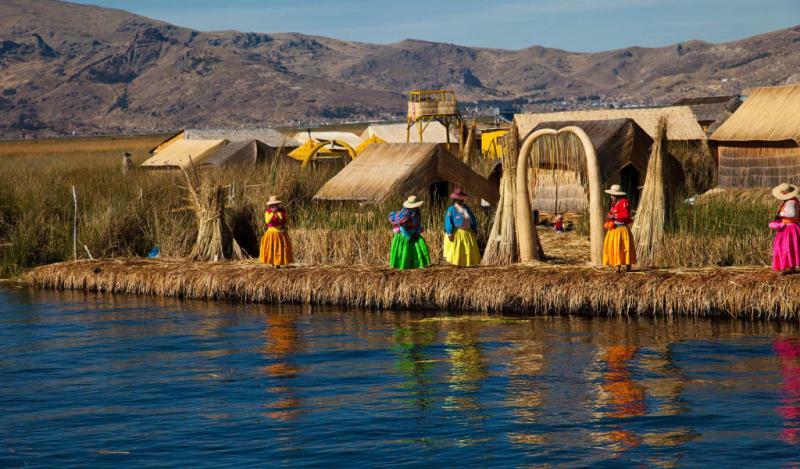 After the floating island you will continue along Lake Titicaca until you come to the gentle natural harbor of Taquile Island, a stationary island almost 30 miles east of Puno. The slope of the island is steep from shore to tip with terraces that stretch along the sides of the island allowing for agriculture and irrigation. The town sits along a tiny plateau with some homes edging along the less steep slopes of the hills. The roofs are a bright pink while the stone buildings keep the interior cool in the summer and warm in the winter. At the top of the island you can see the expanse of the lake, where the vastness of the water comes to light within the main square of the town. 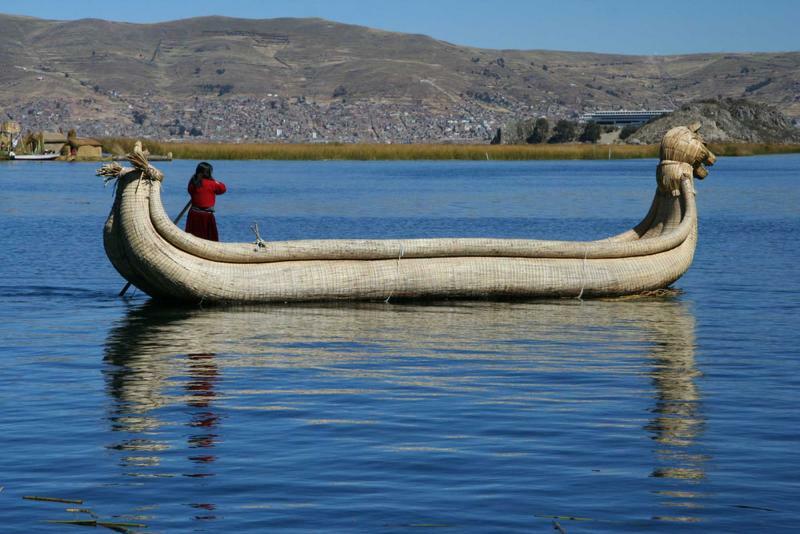 The sun meanders across the sky and you make your way back to the boat to return to the shores of Puno. The sparkling clear waters of Lake Titicaca drift beneath you as you fly over the Andes and away from the undulating mountains and vibrant colors. Arrive back in Lima and settle into your luxurious accommodations of the Hotel Jose Antonio, located in the beautiful neighborhood of Miraflores. Stroll along the winding walkways where the scent of the sea blows in on the back of the breeze. The Kiss, a large statue in Lover’s Park, showcases two people wrapped in an eternal embrace overlooking the ocean. The cool air of the ocean sweeps across the city and brings you back to the memories of the Machu Picchu and sitting amidst the clouds. 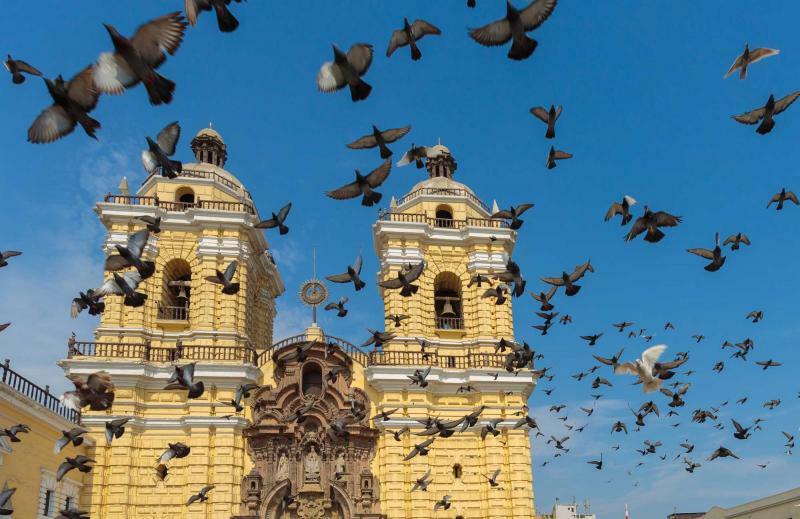 Lima stretches out like a distant oasis as you make your way out of the city and into the arid desert of Ica, which is also an important agricultural region of Peru. 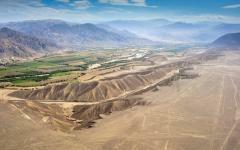 The sweet smell of grapes and dry earth stretches across the open desert plain. 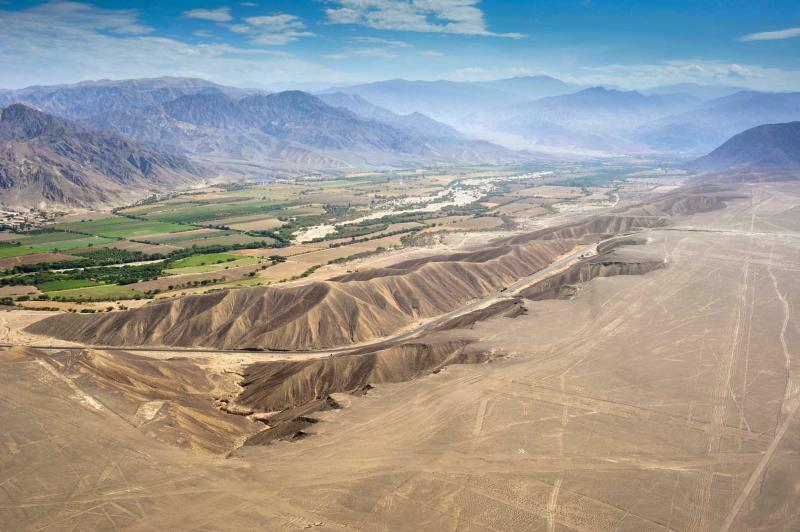 When you arrive in Ica you will board a sightseeing plane and ascend into the open sky to view the famous and mysterious Palpa and Nazca Lines. 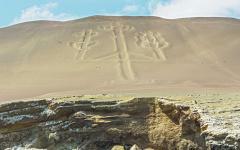 Scattered around the Nazca plateau, the lines are large geoglyphs showing a variety of natural and geometrical objects, from a bird to a monkey, carved into the earth and stretched over an expansive area only visible from the sky. Continue on to the Haucachina Lagoon to experience the oasis within the sand dunes of the desert. It feels as if you have traveled to the Sahara, with dunes rising and surrounding you in every direction. The palm trees sway in the desert breeze. The natural spring of the oasis is cool against your skin. The sun is warm as it drifts across the sky. From secluded relaxation along the water to the loud rush of adrenaline that comes with dune buggies, around the oasis you can soak in the sun or the sand, both offering the warm embrace of the desert before arriving in the town of Paracas. 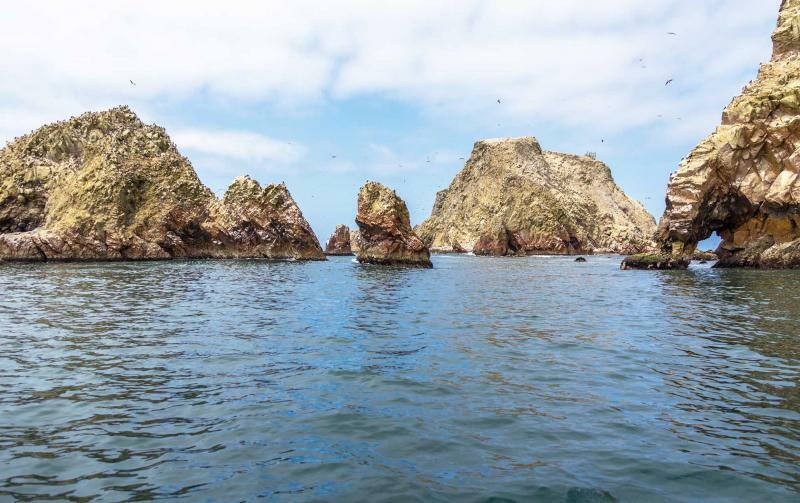 Today you will venture away from the desert oasis of Paracas and cruise along the cool, sweet ocean to the Ballestas Islands. The mist is refreshing and cool blowing in the breeze, while the fresh saltwater scents wraps around you. 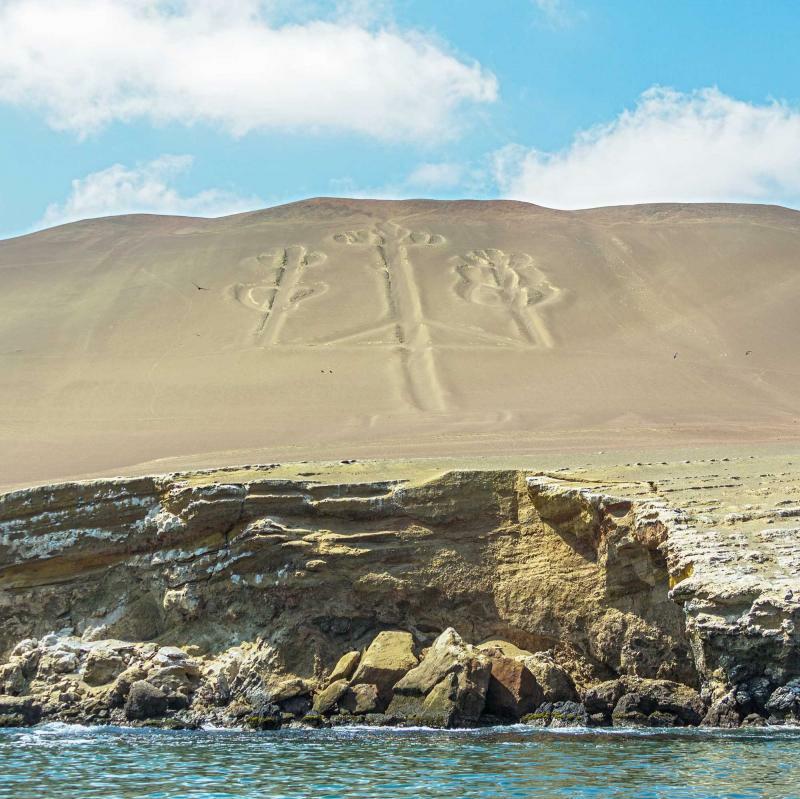 Look back at shore and see the stationary candelabra of Paracas drawn into the hillside like the Nazca Lines. 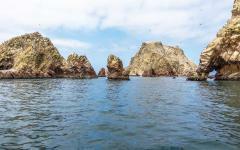 The Ballestas Islands are a series of rock formations that have become a haven for wildlife along the Peruvian coast. 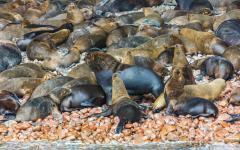 Over the crash of waves you can hear sea lions barking. Their slick bodies lounge in the sun along the shore. Sunlight shines through the craggy holes in the rocky islands like tunnels to nowhere. 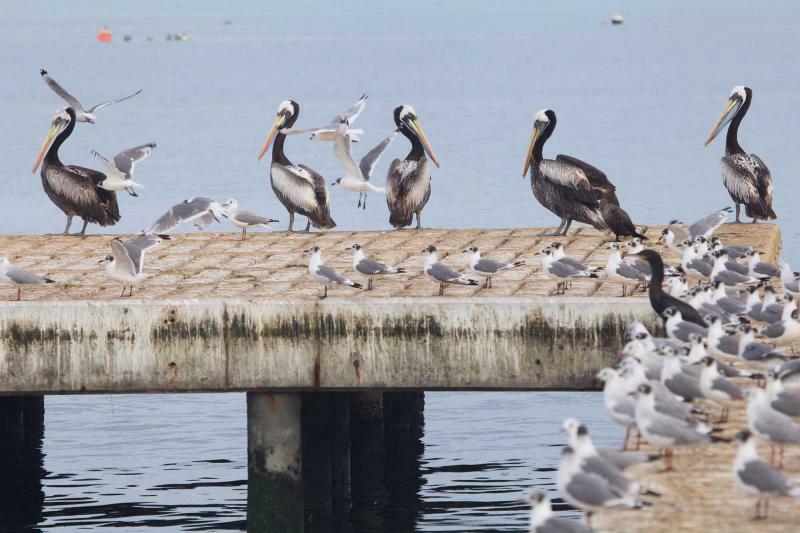 Once on shore you will journey to the stunning Lagunillas located in the Paracas National Reserve. You can see the arid hills reach the corners of the sea and roll into the horizon. Climb the rocky terrain and look out into the water, the coarse earth hard against your palms. You can hear the crash of waves and the soft whisper of the breeze. Enjoy a delicious and rich lunch at San Jose in Chincha, a colonial hacienda that dates back to the 17th century. The hacienda stretches the length of a city block with arches opening the heart of the building to the outside world. The opulence of the building and the decadence of the food seems like it couldn’t have changed in almost 400 years. After lunch you will return to Lima for your flight home. From the winding eclecticism of Lima to the magical wildlife of the Amazon, the cultural sensations of Lake Titicaca to the unique lines that decorate the Nazca plain, you have traversed Peru and have seen that the city of Machu Picchu that floats in the clouds and the oasis of Paracas as it twinkles beneath the sun. The world is filled with wonders; however, none can beat the Inca-credible wonders of Peru. 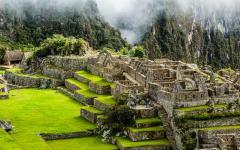 If you'd like to extend your Peru vacation, take a look at the trip reviews for Machu Picchu. 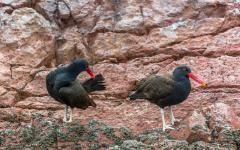 You will get ideas and read about what other travelers enjoyed in Peru.